Oretorp lies in a natural setting in the outskirts of a beech wood north of Lake Ivösjö embedded in an old cultural countryside with orchards, pastures and stonewalls. A private road leads 450 m to the beach and a private dock. Lake Ivösjö is an excellent fishing water, offering a wide variety of species. We offer a complete package for a fishing holiday. We speak English at Oretorp, but can also communicate in German. The best fishing is from April-May and September-October, but there is good fishing during the summer as well. Pike is at the top of the catch list. We have bicycles and canoes for hire and help arrange hikes and canoe tours. We welcome all anglers to our beautiful fishing area! Lake Ivösjö is one of the Swedish lakes with the greatest variety of species in Sweden. 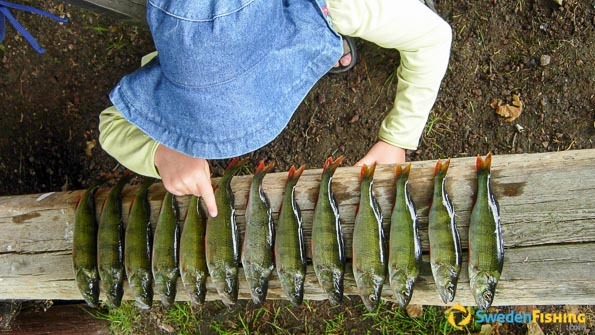 Our list includes pike, pikeperch and perch. The guest record fish in 2010: pike (12 kg), pikeperch (5.8 kg) and perch (1.4 kg). We have five-meter boats with motors ranging from 5 to 8 hp. Lake Ivösjö offers trolling, spin and rod fishing. When it freezes over the ice fishing is great. Minimum sizes in Lake Ivösjö: Gullspång salmon 60 cm; Canada char 60 cm; Brown trout 60 cm; Pikeperch and pike 45 cm. 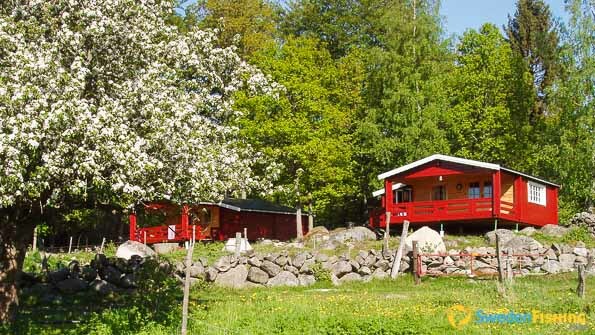 Our cabins include Ljungen at 37 sq.m. It has two rooms, four beds, kitchen and shower. There is a wood- fired stove and a large, splendid roofed porch. The Heden cabin is 32 sq.m, with 2 rooms, sleeps four in two beds and a sofa bed, kitchen and toilet/shower. It too has a large roofed porch. Furniture provided includes kitchen table with chairs, lounge suite, TV/radio, garden furniture and grill. The kitchen has china, pots, frying pan, water heater and more. The beds have quilts and pillows. Sheets and towels can be rented. Cleaning equipment are available for final cleaning on departure. Located in Kristianstad Municipality, Oretorp is 143 km from the Öresunds Bridge. It’s a two-hour car trip from Kastrup/Copenhagen and 1.5 hours from Sturup/Malmö. It’s also possible to travel to Kristianstad by train from Kastrup and Malmö.